When I made egg curry a few days ago, I wanted to make some different parathas from the normal ones that I make usually. Yes, as I mentioned before, I am going through my recipe book and trying to cook recipes that I have not made even once. Some of those pages are stained and have yellowed but I feel sad that I haven’t bothered to try them for so many years. Amritsari paratha was the target. The amritsari parathas I have tasted in India are dripping with ghee and very rich. 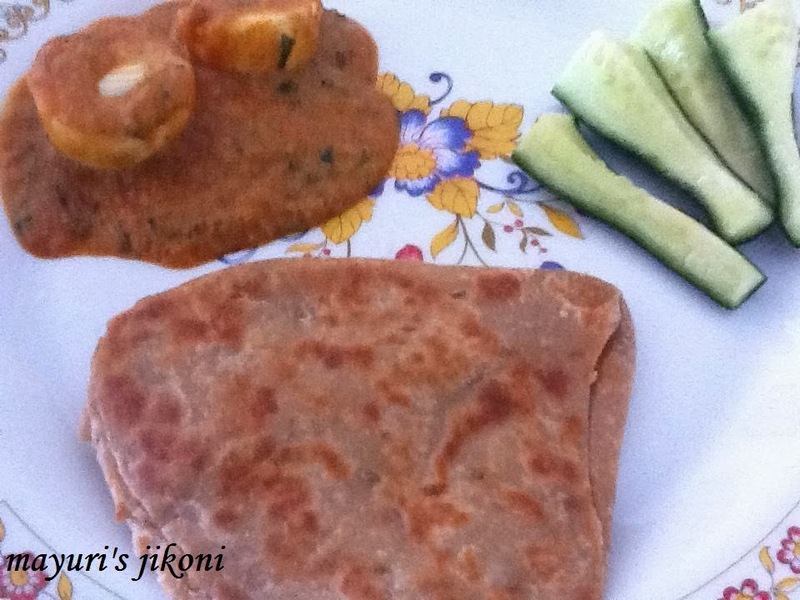 I am glad I made the parathas as they came out really delectable. I love that the ingredient was wheat flour and not plain flour. Simple flaky parathas are scrumptious with any curry. Have the leftover parathas with a cup of masala tea. Sieve flour, baking powder and salt together into a big bowl. Add cumin seeds and form a dough using the water. The dough should not be too hard or too soft. Rub 1 tsp of ghee over the dough and knead it till the dough is soft and smooth. Cover the bowl with the dough in it and let it rest for 30 minutes. Prepare the paste by mixing the plain flour and ghee. Heat the tawa or frying pan over low heat. Divide the dough into 10 parts. Form a ball from each part. Using a bit of the flour, roll the dough into a 6 to 7 inch circle. Smear a bit of the paste all over the rolled circle. Fold it into half. Smear paste over the folded half. Fold into a quarter. Roll into a triangle shape. Put the rolled paratha on the hot tawa. Cook till light brown specks appear. Turn and cook the other side till light brown specks appear. Drizzle about a teaspoon of oil or ghee around the paratha and cook both sides till it is golden brown and cooked. Repeat steps 9 to 15 with the remaining dough. Serve hot parathas with your favourite curry or dal.